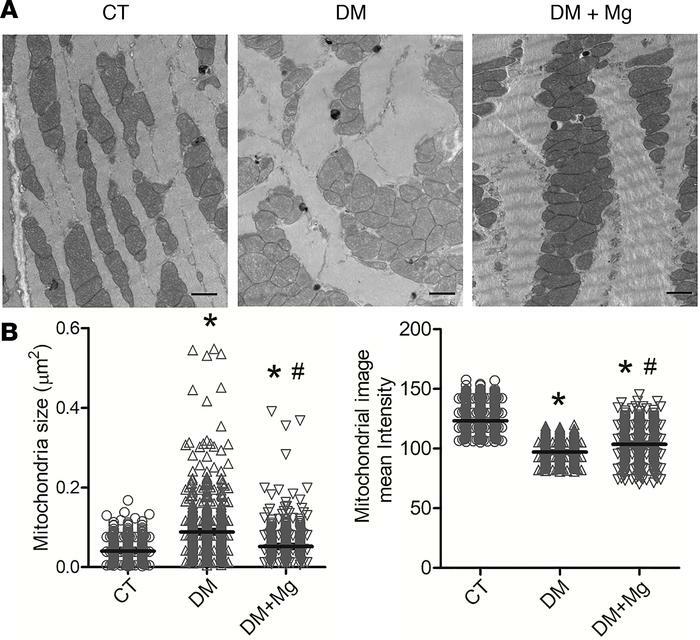 DM mice showed mitochondrial structural abnormalities, which were improved with dietary Mg.
(A) Electron microscopy of mitochondria showed altered distribution and morphology in DM mouse heart tissue. These changes were improved by dietary Mg supplementation. Transmission electron micrographs of hearts from control mice (CT), DM mice, and DM+Mg mice. Images were taken at ×12,000 magnification. Scale bars: 1 μm. (B) Mitochondria size was evaluated by the area of mitochondria, and the cristae structure was evaluated by the mitochondrial gray intensity mean values. Over 14 images for each group and 489–707 mitochondria were used for data analysis. One-way ANOVA with Bonferroni post hoc test was used; *P < 0.01 vs. control and #P < 0.05 vs. DM. CT, control mice; DM, mice fed with high-fat diet; DM+Mg, mice fed with high-fat diet and Mg in drinking water.